Now through Christmas Eve, Target will be offering a 50% off cartwheel offer on a select toy daily. 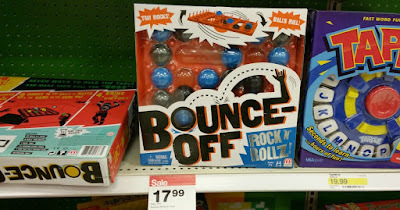 Here's the deal for November 21st - Save 50% off Bounce Off Rock 'N' Rollz Game. Expires: 11/21/2016. Even sweeter, through 11/23 save 20% off your entire toys and games purchase with the Target coupon found in the ad, on the Target app OR by texting TOYS to 827438.